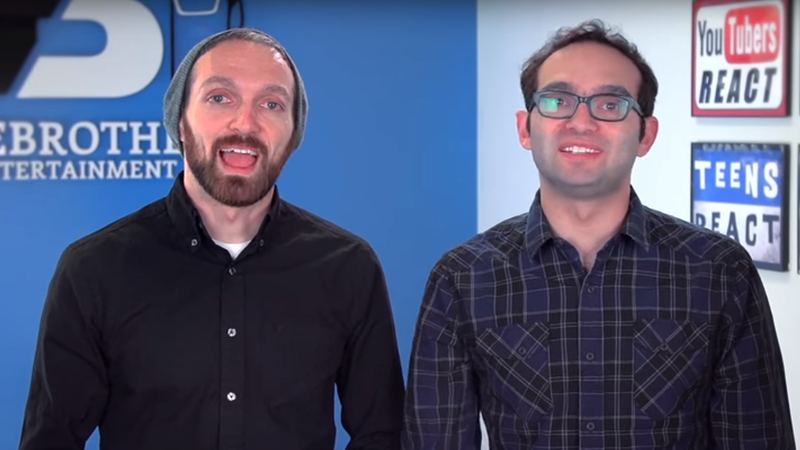 The Fine Brothers pissed off a lot whole lot of people when they announced a bold new scheme to trademark the word “react” last week. I’m one of those people, and I don’t even have any aspirations to be a YouTube star. I just hate greedy idiots. You can’t trademark the word “react.” Sure, the Fine Brothers have enjoyed lots of success and won millions of subscribers by posting videos of kids and old people reacting to all kinds of stuff. Now that they’ve gotten successful, they want to keep growing their empire and making more of that sweet YouTube money by franchising their recognized brand and format. But what the bros didn’t make terribly clear in their initial announcement was that they want to own the word “react” so other YouTubers making reaction videos couldn’t post videos with similar titles. The Fine Brothers claim that they’re not trying to trademark the entire genre of reactions videos. But come on, guys. It’s a very common verb, and one could argue that it’s the only verb you’d use to describe what happens when someone sees a thing and, well, reacts to it. By the way, in case you thought they had a more specific definition, the Fine Brothers’ trademark application says they want to protect the term under “entertainment services, namely, providing an on-going series of programs and webisodes via the Internet in the field of observing and interviewing various groups of people.” Which effectively means that yes, they think they should have a monopoly on the very concept of a reaction video. You might say the Fine Brothers have some kind of moral claim to acknowledgement—except they didn’t even come up with the reaction video idea! It’s an old hat in the TV world, a parlor trick that dates back at least as far as Kids Say the Darndest Things. And while the Fine Brothers say that they’re not planning on trying to take down others’ reaction videos, they’ve been quietly gobbling up trademarks that would give them the power to do just that. The asshats already own trademarks on the phrases “elders reacts” and “teens react,” and they have applications pending for “celebrities react,” “adults react,” and “parents react.” Don’t worry, an attorney is already trying to get these existing trademarks and applications cancelled. This all sounds infuriating because it’s so obvious what these two goons are trying to do. After failing to get a network to pick up their TV show idea, they’ve managed to build a YouTube channel filled with videos that anyone with a camera and some random kids could produce. It’s a tried and true method, one that’s so easy to replicate that many other YouTubers are doing the same thing. The Fine Brothers may not be the first to make reactions videos. But you could say they’ve been the most successful. Now, they want to make even more money being unoriginal. But trademark law was not written to help bearded bros make more money. Trademark law is designed to protect consumers. Coca-Cola got to trademark its curvy bottle, so that other companies couldn’t put lesser colas in similarly shaped bottles and fool people into thinking they were buying Coke. The United States Patent and Trademark Office (USPTO) does not grant protection to companies who try to take generic words, phrases, or symbols and claim them as their own. Just look at Sony who unsuccessfully tried to trademark the term “Let’s Play” last year and got shot down. As much as Sony would love to own the phrase for its own marketing purposes, the phrase is very widely used to describe online videos of people playing video games.